Generally a tough species Abies, include Dwarf, Spreading and Tall Growing varieties, all evergreen conifers. A group of over 50 species of evergreen conifers with symmetrical shapes. The taller growing species and cultivars are generally slow growing, however they can reach to around 10m in height. Also available for sale are medium sized species that will reach around 4m in height. as The really low growing types such as A.amabilis ‘Spreading Star’ and A. balsamea ‘ Verkade’s Prostrate’, these versatile plants can be used as ground cover plants or grown in containers. Weeping species such as A. alba ‘Pendula’ make excellent feature trees in medium to large gardens. Most with attractive foliage and good growth habits, they make good feature trees, are excellent at the back of the garden border and with so many different sized plants fit a range of landscaping applications. 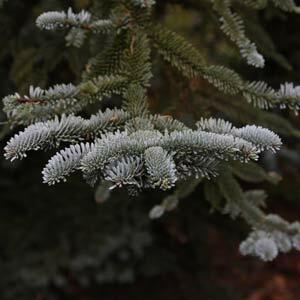 Abies range from dwarf varieties suitable for rockeries and patio pots such as Abies Koreana Tundra, to small trees Abies Squamata (Flaky Fir) with rich brown bark and purple cones. Larger Abies such as A. Firma (Japanese Fir) and A. Homolepsis (Nikko Fir) are majestic feature trees. All species are resilient but prefer cooler climates with moist, humus-rich, well-drained soils. A. concolor is a popular medium growing species and cultivars such as ‘compacta’ and ‘archers dwarf’ are much smaller. Abies alba pendula, amabilis spreading star, concolor (blue form), concolor compacta, firma (japanese fir), forrestii var. smithii (delavayii georgei), homolepis (nikko fir), koreana, koreana silberlocke, koreana starkers dwarf, lasiocarpa compacta, nordmaniana golden spreader, numidica pendula, pinsapo glauca, pinsapo aurea, procera glauca.